Contrary to Internet search engine wisdom, farting does not burn 67 calories and is not a practical weight loss mechanism. One fart burns 67 calories. 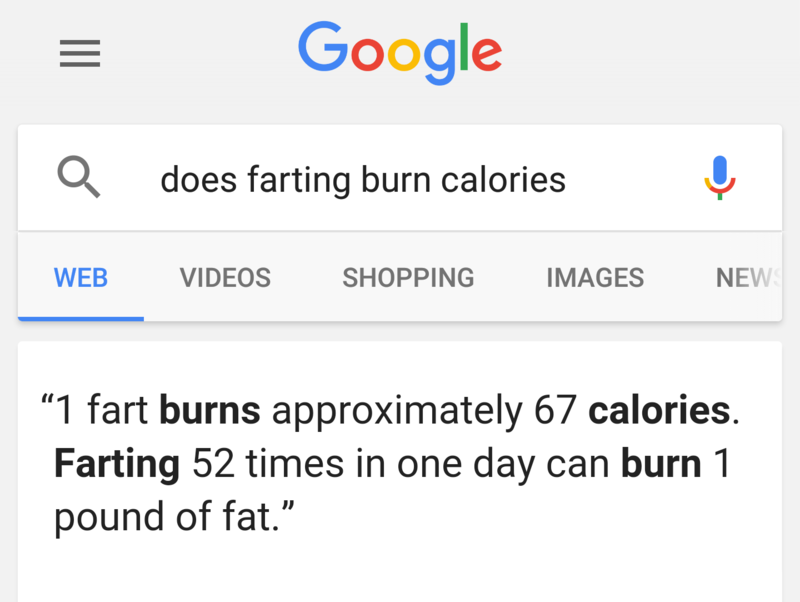 How many calories does farting burn? The amount of calories burned by farting would depend on how long the fart lasts and how much energy you use to do it. Some people believe you can burn up to 67 calories by releasing gas. It should be noted that similar inquiries posed via ChaCha also prompted answers of less than one calorie, not very many calories, and no calories. Some people get a bit desperate when it comes to weight loss. They start wondering which of their daily activities burns enough calories to warrant increasing the frequency. We get questions about calorie consumption in a host of different scenarios. But perhaps the strangest question posed to date is: how many calories do you burn by farting? If you take a moment to think about this, the answer is rather obvious: none! When you fart, your muscles relax and the gas pressure in your bowels do all the work in expelling the gas. The only way you would achieve a measureable figure in the calories burned farting is if you really strained yourself to the limit.